Cook Time: 15 - 20 min. Place a large saute pan over medium high heat and add 1 tablespoon of the butter. Add in Brussels sprouts and cook for 5-10 minutes until lightly browned and fork tender. Remove Brussels sprouts and set aside then add in the rest of the butter to the pan. Add sliced apples and cinnamon, and saute until apples are fork tender about, 7 minutes. 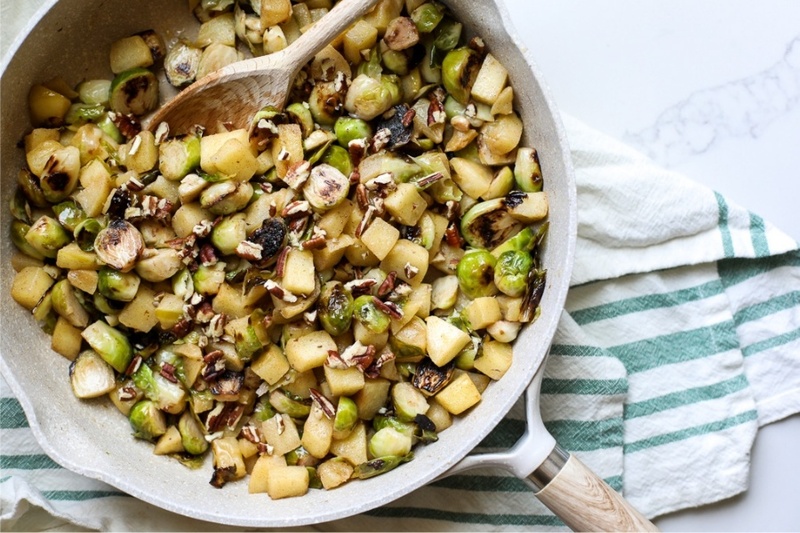 Add cooked Brussels sprouts to sauteed apples and season with salt and pepper to taste. Continue to saute Brussels sprouts and apples until Brussels sprouts are heated through. Garnish with toasted pecans or walnuts and serve.